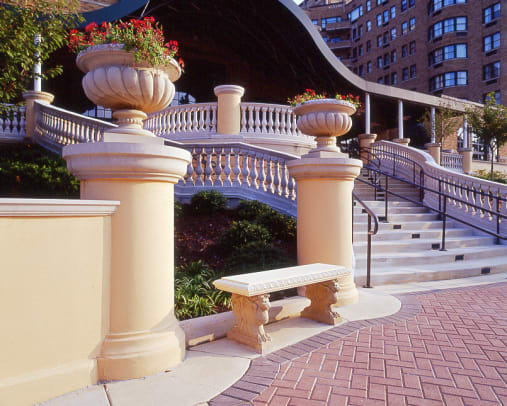 Haddonstone is a world-leading manufacturer of high-quality architectural stonework and garden ornaments with factories and showrooms in both the UK and Colorado. Our experienced team works with leading house builders and developers, contractors and private customers around the world, supplying fine cast stonework to developments of all sizes and specification. Haddonstone’s standard product range offers architects and designers architectural components to meet a broad range of design requirements, and for bespoke styles and designs, our team can produce custom-made traditional, classical and contemporary designs specifically to order. We also offer a very broad range of garden, home and landscape designs including fountains, statuary and sundials, as well as beautiful and practical planters, fireplaces, furniture and garden buildings. We are proud to be a member of organizations including the Institute of Classical Architecture & Art, the National Association of Home Builders and the American Society of Landscape Architects.